Meeting some of the many people involved with Notts Save Our Services and getting involved with anti-cuts activity in Nottingham and Notts couldn’t be easier. 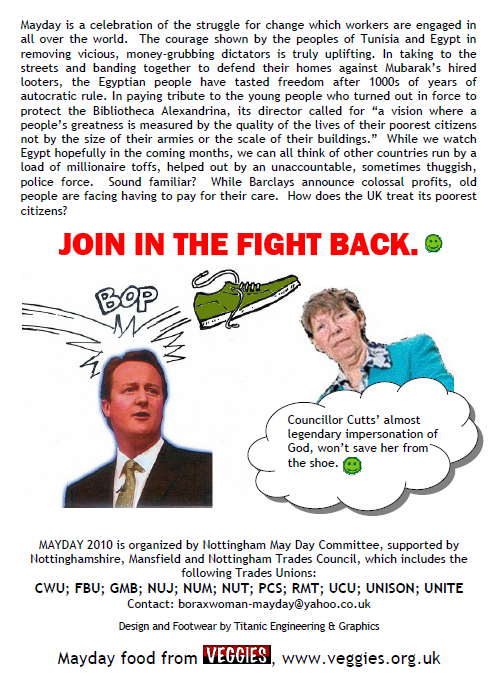 Just come down to the Mayday International Workers’ Day event in Victoria Park, Sneinton on Saturday 30th April. Download flyer here or view below. Assemble in Victoria Park, Bath Street, near the Victoria Leisure Centre at 11 am. 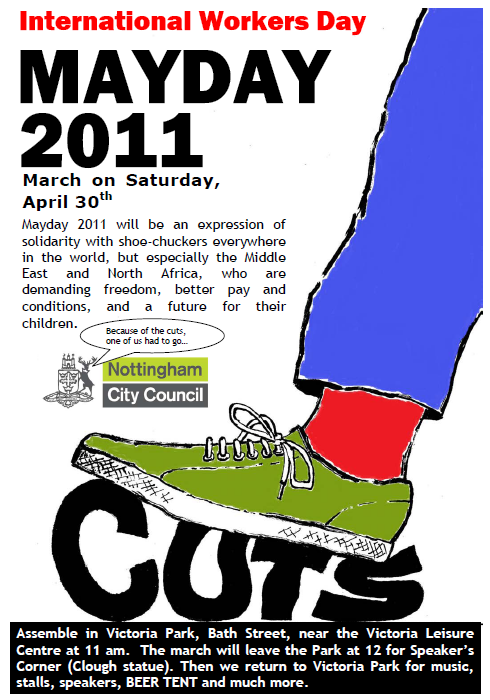 The march will leave the Park at 12 for Speaker’s Corner (Clough statue). Then we return to Victoria Park for music, stalls, speakers, BEER TENT and much more – staying there until mid-afternoon. Mayday is a celebration of the struggle for change which workers are engaged in all over the world. The courage shown by the peoples of Tunisia and Egypt in removing vicious, money-grubbing dictators is truly uplifting. In taking to the streets and banding together to defend their homes against Mubarak’s hired looters, the Egyptian people have tasted freedom after 1000s of years of autocratic rule. In paying tribute to the young people who turned out in force to protect the Bibliotheca Alexandrina, its director called for “a vision where a people’s greatness is measured by the quality of the lives of their poorest citizens not by the size of their armies or the scale of their buildings.” While we watch Egypt hopefully in the coming months, we can all think of other countries run by a load of millionaire toffs, helped out by an unaccountable, sometimes thuggish, police force. Sound familiar? While Barclays announce colossal profits, old people are facing having to pay for their care. How does the UK treat its poorest citizens? JOIN IN THE FIGHT BACK. This entry was posted in Campaign info, Events & meetings and tagged campaign, city. Bookmark the permalink.